As, I’ve previously said, I will not be sharing the details of the classes. Although I am a true believer in sharing what I know…this is a paid class with fabulous instructors…they deserve the credit and the payment for the class. What I will share with you about this card is a bit about the blue background…see the dots on the lower left and the harlequin pattern up the right side? I pressed a stencil onto my finished card and lifted some of the watercolor off with a baby wipe to create that effect…cool right??? Wish you could see the beautiful shimmer from the Wink of Stella marker on the butterfly…guess you’ll just have to use your imagination *grin*. You really mastered the background technique! 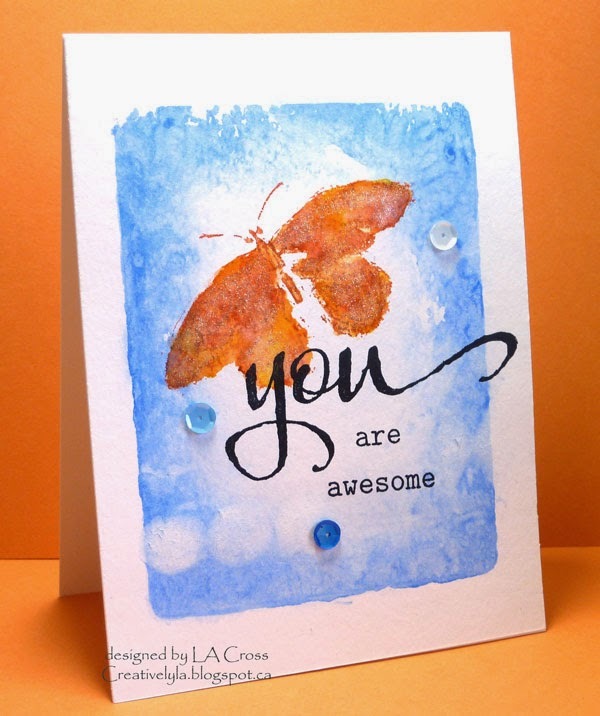 I love your cards, Lee-Anne! They are plain beautiful! Fab card! Love the colors and the super positive message. I need to check out this class – can you share the link? I see the link at the top of your blog – thanks! Yup. The “smattering” works with water colour too. Lovely. But then I am partial to butterflies. Am partial to the smattering too. This is so gorgeous Lee-Anne! I think this is a gorgeous watercolour and the butterfly is lovely. The bold sentiment is fab! Thanks so much for playing along with ASM this week! PS I must sign up for the class, looks like lots of fun!